This year at ONS, Sulzer will be offering expert advice on the repair and maintenance of a wide range of equipment, including pumps, turbines, compressors, motors and generators. The theme for this year’s event is “Transition” and as the economic climate in the offshore business becomes more difficult, Sulzer aims to help customers adapt to the new circumstances and reduce maintenance costs by improving reliability and productivity. As one of the world’s leading independent maintenance providers, Sulzer has the experience and technical expertise to deliver the more complex repair projects in the offshore industry. At this year’s event, Sulzer will have a number of technical staff available to discuss the advantages of using the Sulzer network to deliver a range of maintenance solutions. Every local service center has direct access to all Sulzer engineering and manufacturing facilities around the world, and can deliver this expertise locally. 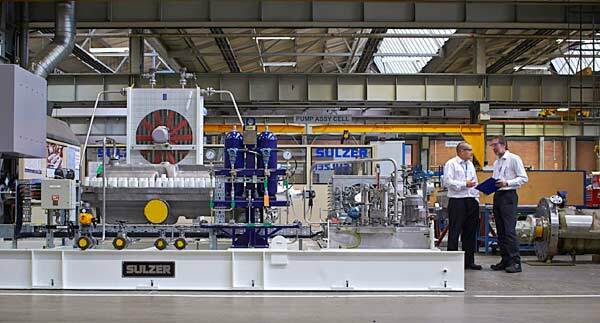 Sulzer’s service centre in Stavanger not only provides pump services but also maintains turbines and compressors, working closely with the company’s centres of excellence in Rotterdam and Venlo to assist with large turbo machinery. In addition, it is able to offer precision-wound coils for both high and low voltage machines, manufactured in Birmingham UK, as well as experienced field engineers to complete on-site projects. As the offshore industry streamlines its business, maintenance operations are becoming more focused on reducing costs with the use of retrofit services and reducing downtime by installing hydraulic upgrades and advanced coatings. All of the adaptations are being made as part of systematic maintenance programs. Sulzer is also one of the world’s leading pump manufacturers, supplying state-of-the-art technology to the oil and gas industry. The company has over 20 manufacturing sites across the globe, capable of designing high performance, reliable and energy efficient pumping solutions. In support of this operation, Sulzer offers a global support network that contains the expertise and facilities to maintain, repair and upgrade existing equipment and ensure continued, reliable service. Visit Sulzer on Stand 6000 in Hall 6 – ONS 2016 at the Stavanger Forum from 29th August – 1st September.